San Francisco is often called the most beautiful city in the world. Here are the 10 best and most popular ways to see the city and its magnificent surrounding areas. Find out what makes San Francisco so remarkable! Hundreds of thousands of people ride the easy 8-mile bike path from Fisherman's Wharf, through Crissy Field, and over the Golden Gate Bridge to Sausalito every year. Most return to San Francisco by ferry after a lunch in sunny Sausalito and pass Alcatraz along the way. This ride has been described as the "best urban bicycle ride in the United States, if not the world." Ferry tickets ($10-11) are additional. The same tour as above, but guided by an expert San Francisco tour guide. Departs on Tuesdays, Thursdays, and Sundays at 10am. This ride is 8 miles long, takes 2 hours, and you will be left in Sausalito from where you can take the Ferry back to San Francisco (if you wish). Ferry tickets are $10-11 additional. This bundle of tours allows you to see almost all of San Francisco, and includes 1) the popular tour of Alcatraz which explores the island, its prison and its history of notorious inhabitants; 2) a city tour of San Francisco on an open top double decker bus (good for 48 hours); 3) three walking tours (Chinatown, North Beach, Barbary Coast); 4) Panoramic Night Tour (worth $30); 5) One-hour bike rental (with purchase of one hour); 6) Sausalito Tour (worth $25); 7) The 7D Experience (an interactive simulation ride). The Alcatraz tour, included in this package price, is normally $30 and cannot be sold separately. To get this package with an Alcrataz ticket, reservations must be made at least FIVE days in advance. 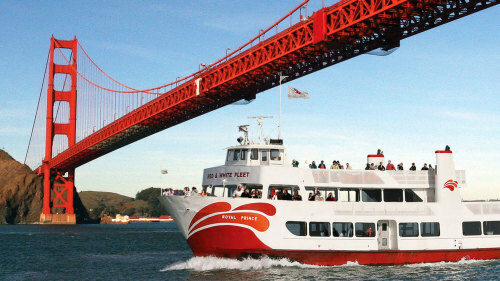 See all the major San Francisco attractions on the largest fleet of Hop-On/Hop-Off open top buses in the city. Enjoy a live English commentary by informative guides and/or a recorded commentary in 10 languages. These tickets are good for 24 hours and you can hop on and hop off these buses at your leisure. Just to the north of San Francisco are the giant redwoods of Muir Woods, some as tall as 250 feet, a tour of which is seamlessly combined with a visit to scenic Sausalito, with its unparalleled views of San Francisco. Your visit to Northern California is not complete without a visit to wine country. Your tour by motor coach starts in San Francisco and arrives in the premium winemaking southern region of Carneros. Along the way you will see all the amazing scenery, including the Golden Gate Bridge, Marina District, Presidio, & Marin County and will visit three or four of Napa and Sonoma's most famous wineries. This is a full day trip to Yosemite National Park- one of the most spectacular spots in the entire world with its triple offerings of world famous waterfalls, giant sequoias, and 3000 foot granite walls. A must see for visitors to California! Join this popular tour for a nighttime ride through San Francisco and many of its neighborhoods and famous destinations on a luxurious motor coach. Fill out this form to reserve your discounted tour or to receive more information. No commitment necessary. We’ll be in touch to discuss your reservation shortly.